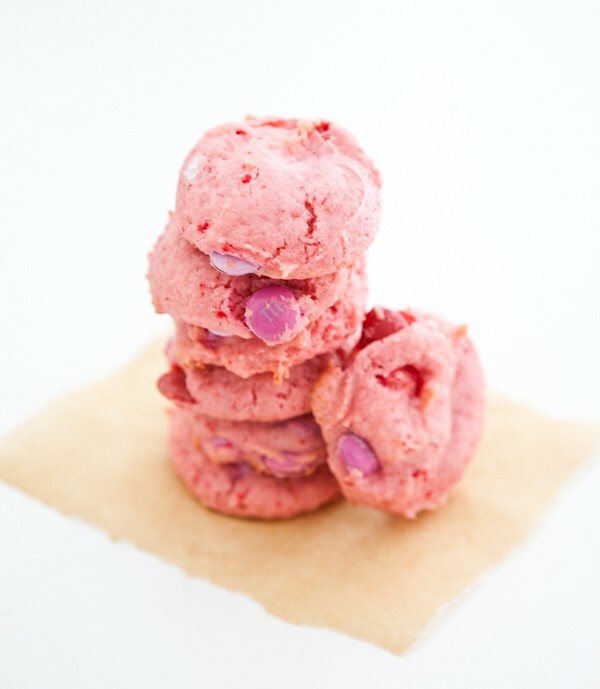 I’m still making Valentine’s Day treats, and I have a few more planned in the next two days. My husband took my son to get me something for Valentine’s Day, and he got me a box of brownie mix, so I guess he wants brownies too for Valentine’s Day! I’m brainstorming ideas now on how to make them more festive. Today I made these cookies. There’s just something I love about pretty pink cookies. They’re so cute and girly. 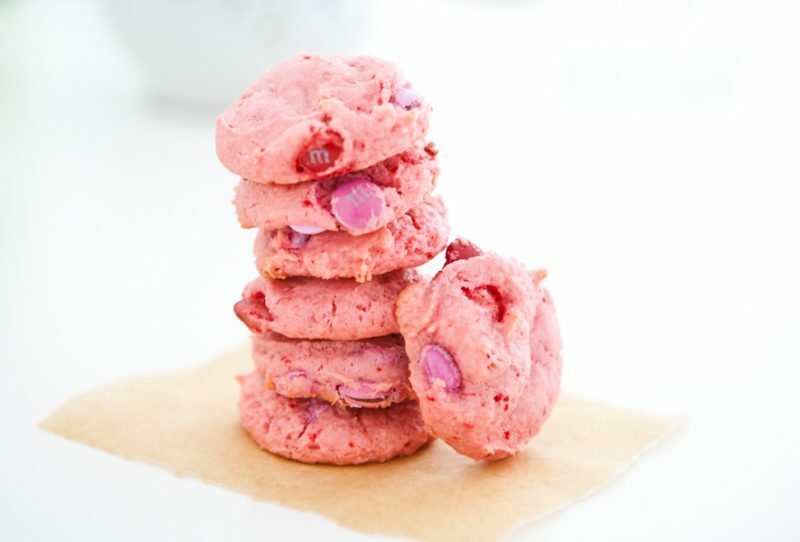 These little cookies are made with strawberry cake mix and pretty pink, red and white M&M candies. They are really easy and take almost no time to make. I made these cookies today for the teachers at my sons’ school. I hope the ladies like them! Heat oven to 350°. Combine strawberry cake mix, egg, oil, milk and strawberry jam in a large bowl. Mix well to combine. Fold in M&M's. Drop cookie dough by the tablespoon onto parchment lined cookie sheet. Bake for 10 - 12 minutes, or until just set. Cool for 5 minutes on cookie sheet before transferring onto cooling rack. Cake mix cookies have always been a favorite of mine. Love the strawberry! Try again!! These are too precious…everyday should be valentines day. Such a pretty pink color — my girls would adore these! These are so pretty! What a fun cookie! I bet those teachers loved these! They look so yummy! 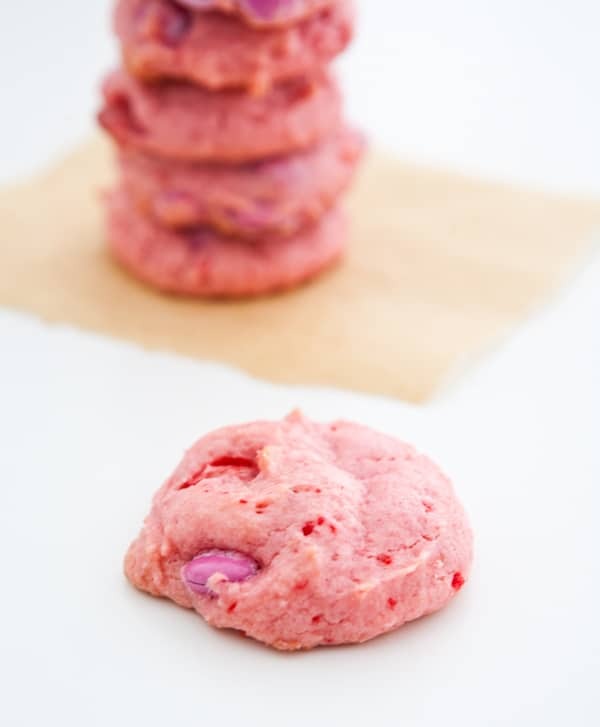 I am having trouble printing your strawberry cookie recipe? Cany you help me? If you click the printer icon, it should bring up a black and white page with just the recipe then click file in your browser and then select print. Thanks Angie, The pintrest button and the print were so close together I was having trouble clicking on print. It was a little hard but, finally got it to workThanks. The print is really small but got a bigger print!!!!!!!!!!!! Cake mix cookies are some of my favorite. Can you make this recipe without oil? Does it affect the fluffiness of the cookie? Web hosting services in India is not too expensive. when someone calls me when i say. This question may seem a bit weird, but do we need the M&Ms?
! Finalmente He encontrado cosa que me ayudó. Gracias ! Howdy terrific website! Doess running a blog such as this require a great deal of work? had been hoping to start my own blog soon. Anyway, if you have any ideas or techniques for new blog ownerrs please share. What size is your cake mix? I’ve noticed that a lot of recipes specify 18.25 oz boxes, but the one I bought today is 15.25 oz. If you were using the 18.25 oz. box, should I add flour, or reduce the liquids to make the cookies? it’s the same size that Betty Crocker makes, not sure of the oz.